I don’t know about you but I’m starting to like the fact that companies are realizing the collector editions are worth-while investments, especially for those games that do it well. Case in point is the recently announced Kingdom Hearts HD 2.5 collector’s edition, just look at all the stuff you get in this one! I really want that plush and that steelbook to be honest! However there is a catch! 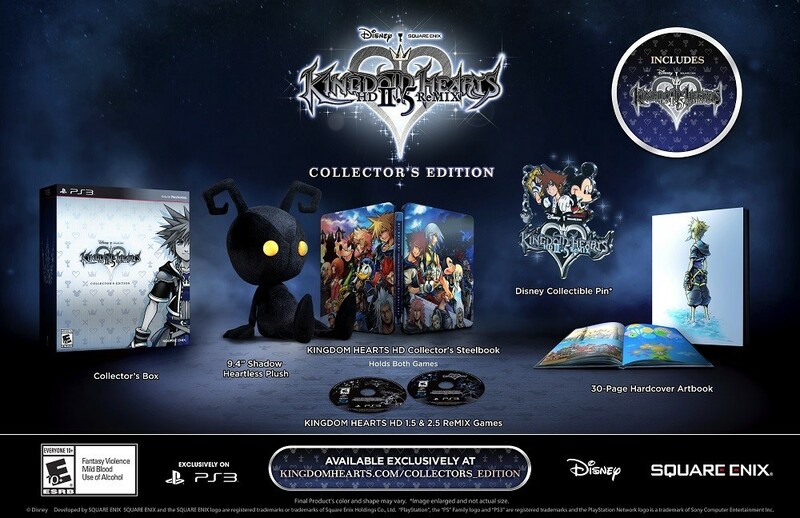 The collector’s edition is only available directly from Square-Enix’s website @ http://www.kingdomhearts.com/COLLECTORS_EDITION for $99.99 + $9.95 for the shipping, bringing the total to $109.94!. There hasn’t been any other word as of yet if you can preorder this anywhere else. Still at that price point and for what you get for it, I’m going to get my preorder in now before they’re all gone. And yes you will be charged as soon as you submit the order folks. Kingdom Hearts HD 2.5 ReMIX releases on the December 2nd, 2014 for the PlayStation 3.